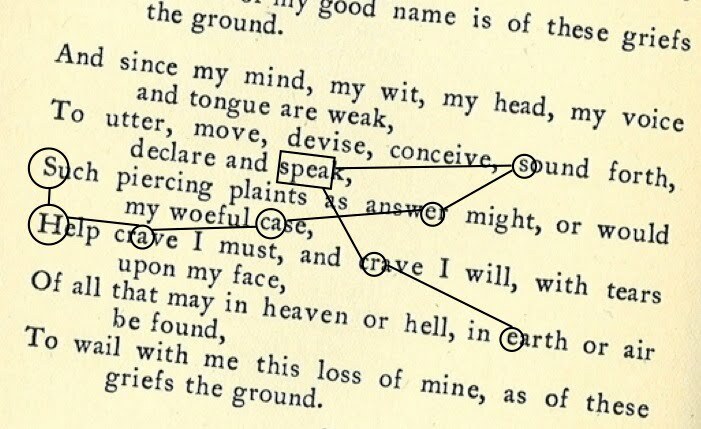 Although there are a few hundred lines of verse indisputably attributable to De Vere, none are in the characteristic Shakespearean blank verse or indeed, if one is being exact, any of the metrical forms used regularly by Shakespeare. There is very close to nothing whatsoever connecting the two men as writers. Yet De Vere's favourite metre seems to have been the lolloping fourteener which fell out of favour in the 1590's and which Will only uses for parodying other writers. Here is De Vere, lolloping in his fourteeners. People who claim they can see any kind of genius in this are either kidding themselves or arguing for argument's sake. In the real world, these similarities between the two poets do not exist. Will isn't really similar to anyone. Here's a bit of Will, sighing on a moonless, flower-scented evening in Belmont. Half the cast will be arriving in the morning (these journey times from Venice really do take a bit of fathoming). Anyway, the real thing. Now some more De Vere, on his favourite subject again. Oxfordians account for the pedestrian cessquipedelia (that's sesqui+1, but written by De Vere) by claiming it is all the Earl's juvenilia. This is a strange thing for a 12-year-old to be writing. My death delayed to keep from life, the harm of hapless days. Here's Will doing fourteeners in Midsummer Night's Dream. Who does this sound like? But stay: O spite! But Mark, poor knight, What dreadful dole is here? Eyes, do you see? How can it be? O dainty duck, O dear. I would go on but there are real poets, like Thomas Hardy, who know how to use fourteeners musically. Will is parodying poets like Oxford whose verse contains so many monosyllabic caesura that it hardly qualifies as verse. Furthermore, there is a masterful piece of work on the differences between the two poets here. The next time an Oxfordian insists on you reading Looney or Ogburn, insist that they read kj, who is a genius. Or, if I might be given liberty to express that in other words, please don't sue me for reposting your brilliant cryptographic discovery. The whole Oxfordian house of cards is founded on so-called 'similarities' and 'resemblances' in the work of the two writers 'discovered' by Looney, then restated by Ogburn, then academicised by Sobran when not one of them could tell Oxford from Churchyard, let alone Shakespeare. The modern generation of Oxfordian sages are no better. Roger Stritmatter, proved to be entirely unable to defend his assertion that a poem by Dyer contained Shakespearean qualities discernible by anyone 'widely read in the canon'. If you can't see this—if you aren't dumbstruck by the idea that there are people who don't recognise the gulf in quality between Will and Ed and Thomas, you should take up stamp collecting or botany. You don't belong in a discussion of the work of Will Shakespeare.